Safari displays your Top Sites as a series of small, medium, or large thumbnail images. Screen shot courtesy of Coyote Moon, Inc. The Top Sites feature in Safari displays thumbnail images of the websites you visit most often. Rather than type in a URL, or select a bookmark from the Bookmarks menu or the Bookmarks bar, you can just click on one of the thumbnails to quickly visit a website. 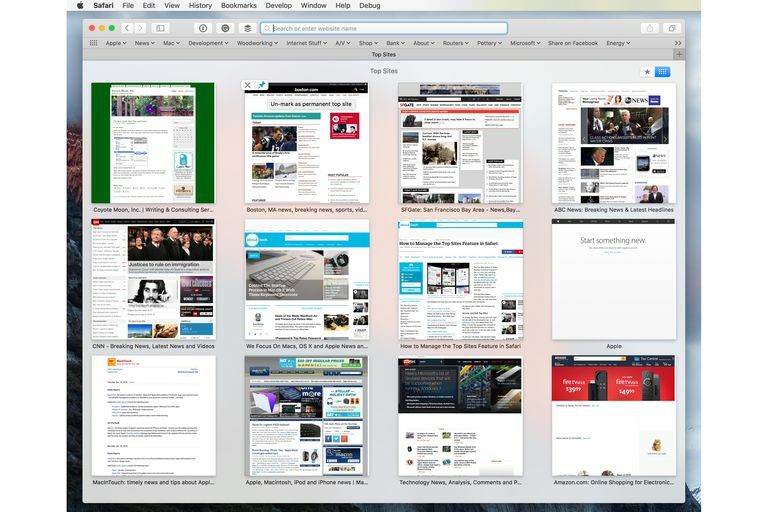 The Top Sites feature was first introduced with the release of OS X Lion and Safari 5.x and was intended as a possible replacement for bookmarks as the major way to navigate to those websites you viewed most often. Since the initial inclusion of Top Sites in Safari, it has undergone a few changes and updates, resulting in some features requiring slightly different methods to access them as time went on. The Top Sites feature automatically keeps track of how often you visit websites and displays the ones you visit most, but you're not stuck with the results. It's easy to add, delete, and manage your Top Sites. To access Top Sites, click the grid icon near the left side of the Bookmarks bar, or click the History menu or Bookmarks menu (depending on the version of Safari you're using) and select Show Top Sites. If a site has updated the contents of the page since the last time you visited it, you'll see a star icon in the top right corner of the site's thumbnail (Safari 5 and 6 only). To edit your Top Sites, click the Edit button at the bottom left corner of the Top Sites page (Safari 5 or 6). For later versions of Safari, you can hover your cursor over the Top Sites thumbnails to reveal icons that let you delete a page, or pin it to its current location, preventing the pinned website from moving around on the Top Sites page. You can rearrange thumbnails by simply dragging them to a new location on the Top Sites page. When you're finished making changes to Top Sites, click the Done button in the lower left corner of the Top Sites page (Safari 5 or 6). There are three options for the size of the thumbnails in Top Sites, and two ways to make the changes, depending on the version of Safari you're using. In Safari 5 or 6, use the Edit button in the bottom left corner of the Top Sites page. You can then select from small, medium, or large thumbnails; the default size is medium. The size of the thumbnails determines how many sites will fit on a page (6, 12, or 24). To change the size of the thumbnails, click the Small, Medium, or Large button in the lower right corner of the Top Sites page. Later versions moved the thumbnail size/number of sites per page to Safari preferences. Use the drop-down menu next to the item labeled Top Sites shows: and select 6, 12, or 24 sites. To add a page to Top Sites, open a new browser window (click the File menu and select New Window). When the target site loads, click and drag its favicon (the small icon to the left of the URL in the Address bar) to the Top Sites page. To permanently delete a page from Top Sites, click the close icon (the little "x") in the top left corner of the page's thumbnail. To pin a page in Top Sites, so that it can't be replaced by another page, click the pushpin icon in the top left corner of the page's thumbnail. The icon will change from black-and-white to blue-and-white. To unpin a page, click the pushpin icon; the icon will change from blue-and-white back to black-and-white. To rearrange the order of the pages in Top Sites, click the thumbnail for a page and drag it to its target location. The Top Sites icon isn't a permanent resident of the Bookmarks bar. If you want to add the Top Sites icon to or delete it from, the Bookmarks bar, click the Safari menu and select Preferences. In the Safari Preferences window, click the Bookmarks icon, and then check or uncheck "Include Top Sites." You'll still be able to access your Top Sites via the History menu. If you want to open all new Safari windows in Top Sites, click the Safari menu and select Preferences. In the Safari Preferences window, click the General icon. From the "New windows open with" drop-down menu, select Top Sites. If you want new tabs to open in Top Sites, from the "New tabs open with" drop-down menu, select Top Sites.